ACEC Oregon: Serving the business needs of engineering and surveying companies in Oregon and Clark County, Washington since 1956. The new Vancouver Waterfront Park opened to the public last September. The park is the main public amenity that is part of the Vancouver Waterfront master plan, which was crafted to reconnect the city of Vancouver to the Columbia River. The new park creates public access to the river for the first time in more than a century. Built on a former industrial paper mill site, the project features plazas, an extended Vancouver Renaissance Trail, viewpoints, water feature, playground, and urban beach. The project also features the Grant Street Pier, a concrete, cable-stayed structure projecting over the Columbia River that serves as the park’s focal point. The iconic pier design is a thoughtful combination of architecture and engineering, while providing a safe and accessible waterfront experience at the Columbia River shoreline. The project team faced many challenges on this complex brownfield site because of its industrial legacy and because a half mile of the shoreline runs along a very swift and high-wave energy section of the river. 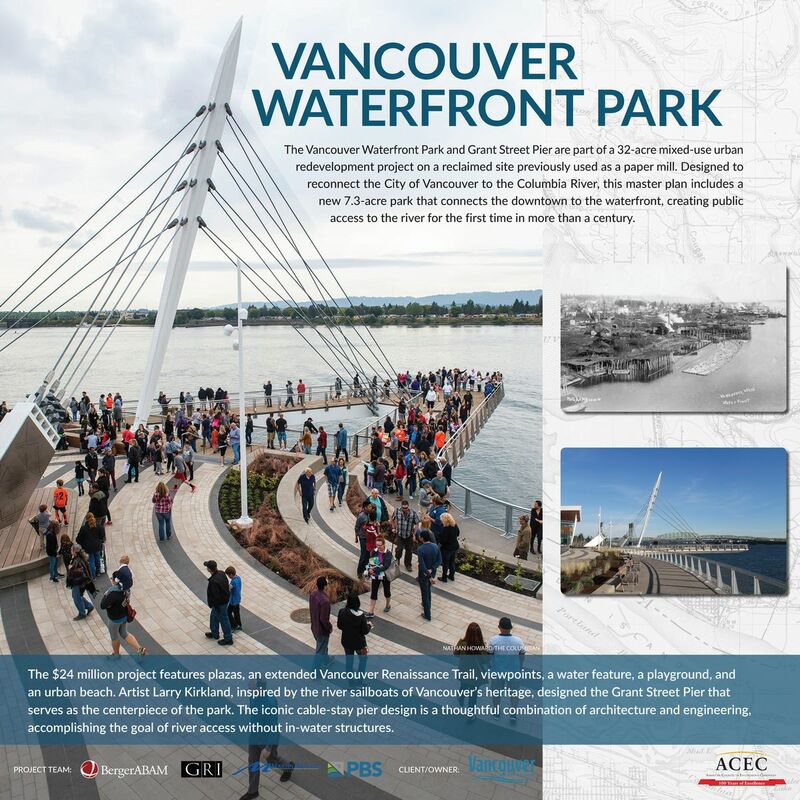 A strong relationship between the project team, City of Vancouver, community, and regulatory agencies was required to complete this project over the course of six years. Click here for a PDF of the 2019 Engineering Excellence Awards magazine published by the DJC. Slideshow of all the 2019 entries featuring each project’s display panel. Click HERE to learn more about Engineering Excellence. Washington Paid Family Medical Leave is Coming!